Just like there’s no template for a home, there’s no set size for a stairlift. Rather, these mobility devices come in a range of configurations, based upon how much weight they can support, how much space is taken up, and how close they fold to the wall. 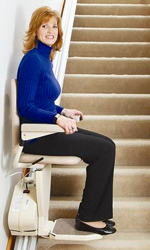 The Indy Pinnacle, a compact stairlift, supports up to 350 pounds and can handle a 27- to 52-degree incline. So, where’s an ideal spot to install it? Older properties – those built in the first half of the 20th century – typically feature a narrow design – one that’s long and stretches back to the rear. Staircases follow a similar pattern, in that they have a smaller opening that extends up to the second floor. For the homeowner looking to install a stairlift, this setup proves to be a challenge, as the standard size is typically too wide. So, a system like the Pinnacle fits into the design better without obstructing the path. Heavy-lifting stairlifts have a particular design: a wider seat and a sturdy system capable of supporting 500 to 600 pounds. These suit a wider range of body types, but in doing so, they require about 36 inches of room. If you’re not predicting you’ll need that level of support, the Indy Pinnacle’s attributes – lifting up to 350 pounds and standing 11 inches from the wall – are ideal for the space. 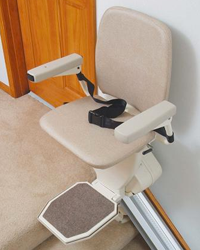 As another benefit, this particular stairlift comes with a track that mounts directly to the stairs instead of the wall – another space-saving attribute. What happens when the stairlift isn’t in use? You fold the seat up against the wall. But in many homes, multiple individuals use the stairs, so whatever mobility device you select shouldn’t block that path. A compact stairlift, on the other hand, folds up so it’s almost directly against the surface. There’s no risk of someone bumping into it, or having to walk over it. Safety comes first with stairlifts. As you select a spot for a more compact design, take a look at both landings. These will be the places you or your loved one will get on and off the seat. As such, there needs to be enough room on both sides to prevent falls. Keep in mind that the seat swivels on both sides, and should swing far enough inward that approaching the staircase’s edge isn’t necessary. As you can see, the typical compact stairlift features a straight track that stretches from one floor to the next. If it matches your needs, based on usage and design, consider that your staircase will need to be perfectly straight – no angles or curves – for it to operate at an optimal level. Does your home have more of a curved shape? Consider a custom lift instead. Whether the Pinnacle or a custom curved option suits your home best, find a mobility solution through Indy Stair Lifts. Browse our store, and contact our team for additional information.